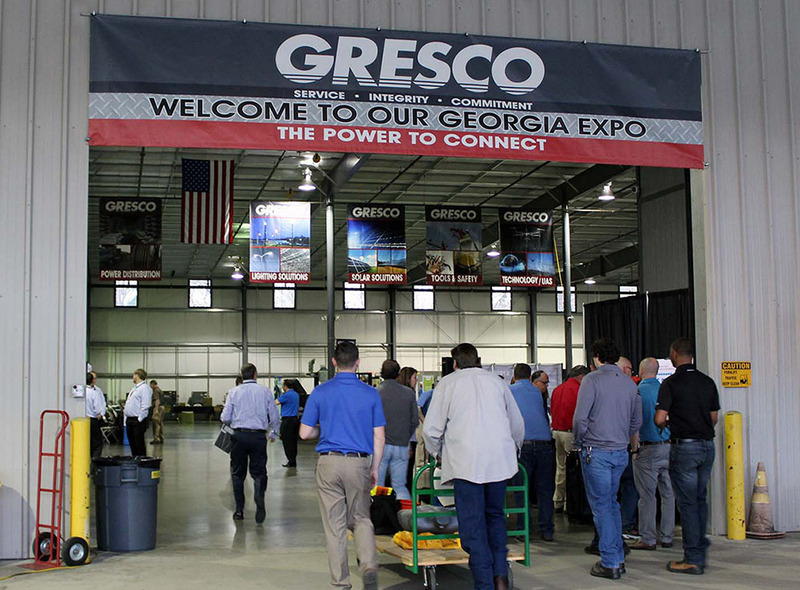 Recapping the 2018 Georgia Expo « Gresco Utility Supply Inc.
Our 17th Annual Gresco Expo was one for the books, with more than 550 customers, vendors, and employees in attendance. The Expo was held on March 29th in the warehouse in Forsyth, Georgia. Vendors began arriving to set up their booths in the warehouse as early as 7am on Thursday morning. An hour later, customers began pouring in at the registration tables, each eager to grab their badge and make their way around the warehouse to see the latest and greatest products and companies in the electrical utility industry. Around mid-morning, customers and even a few vendors gathered near the warehouse loading dock for a 30-minute UAS/drone demonstration by Gresco Technology Solutions. Our FAA Part 107 certified employees demoed the DJI Matrice 200 and the Phantom 4 Pro, complete with the Epson Moverio BT-300FPV Smart Glasses. Questions were encouraged, as well as requests to see another drone demo. Attendees and employees gathered together for a barbeque-catered lunch and then quickly made their way to the gift area for our annual vendor prize drawing, where customers had the opportunity to win gift cards, tools, coolers and other prizes from vendors. This year, Gresco gave away a few grand prizes, including a large flat-screen television, a Pelican cooler, and a Beretta shotgun. The 2018 Gresco Expo would not have been possible without our warehouse crew who exceeded our expectations to ensure our warehouse was spotless – especially with the recently-established construction area behind our warehouse. Thank you also to our Georgia and corporate employees who assisted with numerous Expo tasks. We are so grateful for each of you! We would also like to thank our customers and vendors for your patience and for adjusting to registration changes. We appreciate your commitment and loyalty to Gresco. If you or someone you know is interested in registering for next year’s Expo, please email us at [email protected]. We would love for you to be a part of our event! Meanwhile, we are already preparing for our 14th Annual Florida Fall Fest set to take place on October 26th! Check back on our website for more details.